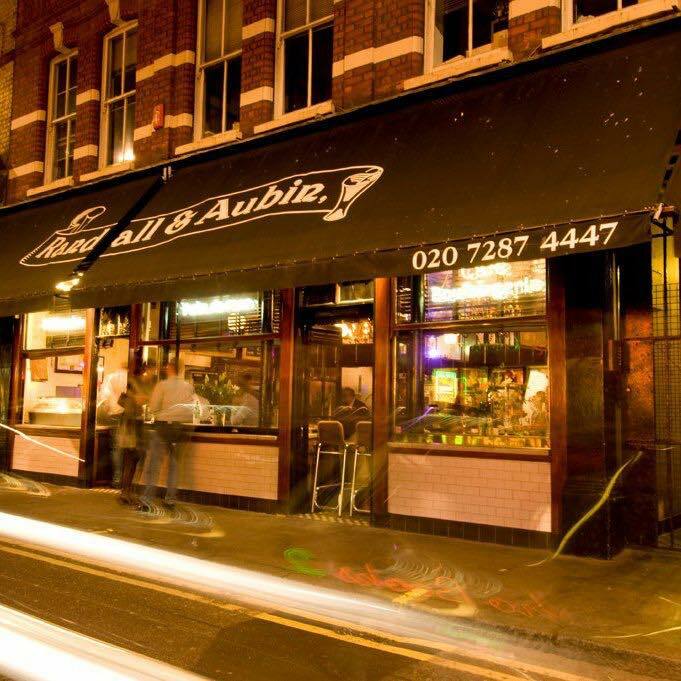 From the outside, the Ruby Café looks like any other small London café. Upon entering, however, the café takes on a more Mediterranean feel, which was pleasing because the weather outside was rubbish and, quite frankly my Nana and I didn’t fancy sitting al fresco. Seating inside is scant, as the café is very small so we raced for a table as the Hoxton lunch brigade took dominance. I let Nana sit with her back to the wall as all the seating was plain wood, with scatter cushions to ease the pressure on our poor behinds and they tended to slip about a bit – I didn’t want Nana to slip off her chair just yet. We asked the waitress for a menu and were told that it was written on a blackboard over the bar at the back. My eyesight is not what it was and Nana’s is marginally worse than mine so I sent her to the bar to peruse it. I wasn’t being unfair – she’s nosier than me, and besides, she could do with the exercise. We settled on our menu choices: I chose Cod with Spring Onion Mash and Nana chose the soup of the day, which was Leek and Potato. Nana said she liked the music, which surprised me somewhat, as I couldn’t hear it. She didn’t think so much of the modern art that adorned the bare brick walls. ‘Load of old junk’ she exclaimed, flicking her hand in a dismissive manner. It took me a couple of seconds to realise that our waitress, who had been approaching us laden with our meal had taken this as a sign to turn back and take the food back to the kitchen. I stood up to catch her attention and promptly stood on the tail of the dog that belonged to the diners on the table next to us. He’s been lying quietly under the table but now let out a pained yelp. Luckily the waitress saw me and brought our food back. This was a relief as we had already waited 20 minutes since ordering. The cod was expertly cooked – but not very well filleted, with several large bones remaining. Nana scoffed and I thought I might have to warn her to please pipe down, but then I saw she was not deriding my food, she was choking on her soup. All being well, we tucked in. My mash was gorgeous. The portion was good – although a side of green veg wouldn’t have gone amiss. The lashings of garlic and slight presence of chilli gave it a kick without being too firey. The bar was small but well-stocked and I was suddenly aware that Nana had downed three glasses of sherry by the time I had finished my meal, and fearing a sudden drunken tirade emanating from her loose-toothed mouth I skipped dessert and went straight for coffee. My cappuccino was divine. Perfect froth and a slightly crunchy powdered chocolate frosting topped a quality brew. We found the service here friendly, although this may have been different if they had understood half of what Nana had said throughout our meal and the fact that they take cash and credit cards was a bonus. Many cafés in the area accept cash only.